The Pakistan cricket team landed in Dubai at 6am on Monday morning. Today they held their first practice session, which is going on as I write, while Younis Khan and Intikhab Alam addressed the media at a press conference held at the Dubai Sports City head office. 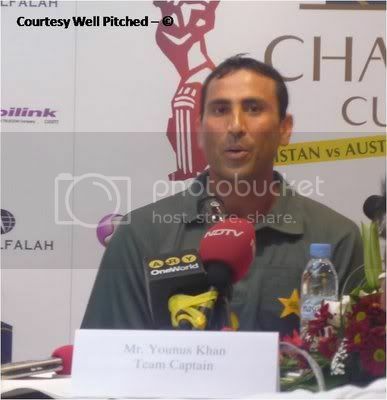 Dressed in all green, Younis Khan looked as confident as ever, which I believe is a good attitude to have and display. Particularly when you're getting ready to play against the best team in the world. Intikhab Alam began the press conference by thanking Dubai Sports City on behalf of the PCB for allowing them to host the ODI series here and also congratulated them on their efforts in putting together a magnificent stadium. He then asked the journalists to put forward their questions and even before Intikhab could finish that sentence, the journalists were on to Younis with a barrage of questions. When asked if he felt at home considering that this was Pakistan's series, Younis responded by saying that Dubai was very much like home for him. He also said that he was pleased to be here and that it was a wonderful opportunity for his young team to play away from home and get used to conditions outside Pakistan. How different these conditions are from what Pakistan has to offer, only time will tell. Someone else pointed out that Pakistan had not played too much international cricket recently and asked how that would affect the team's chances against Australia. To that Younis said that even though his team had not played many ODIs in the recent past, his key players have had ample match practice as all of them participated in the recently concluded domestic one-day championship. Younis highlighted the fact that all the key batsmen had been among the runs during the tournament. I had also pointed that out in a previous post of mine. Younis also added to that by saying that this lack of international matches can be viewed in two ways - the other one being that it could also mean that his team is fresh and hungry, whereas the Australians coming here after a long and gruelling tour may result in them being slightly weary. Younis was then asked what he thought about Australia resting some of its key players, to which he said that even then the world champions cannot be taken lightly as the replacements like Symonds, Watson, and Marsh are top players. He didn't mention Brett Lee while naming the other 3, but a fit and eager Lee could pose the biggest threat to Pakistan's shaky top order in my view. The Pakistan skipper also mentioned that he feels unlucky that he is missing out on a chance to walk out for the toss with Ricky Ponting. He wished the Aussie skipper was coming here with the team. Maybe Younis even knows that without him the Aussie ODI team might be slightly stronger. He was questioned about Shoaib Akhtar's fitness several times and every time Younis has the same response - "He has passed a fitness test and that is why he's in the squad". When another journalist pointed out that Shoaib had also passed a fitness test before the Pakistan vs West Indies series but didn't appear in even a single ODI of the 3 match series in Abu Dhabi, Younis smiled and asked, "Aap logon ki dushmani hai kia Shoaib ke saath?". Translating that would not do justice to the way it was said but it essentially means whether the journalist had something personal against Shoaib Akhtar. Younis then urged everyone to support Shoaib Akhtar and said that he deserves a full opportunity to prove himself and that all of us can witness how he bowls once the series gets underway and judge him after that. At that moment I felt that Younis had just given a nation high hopes once again regarding a fast bowler gone immensely wrong. 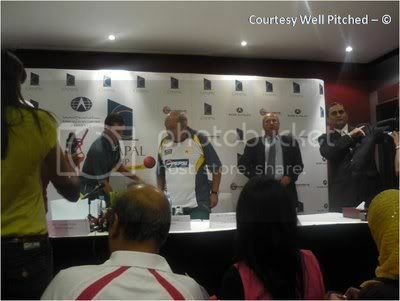 Intikhab concluded the press conference by mentioning that when he first saw the Dubai Sports City Cricket Ground, he felt like re-starting his playing career. He said that, "It looked so good that I wanted to turn my arm over again". It really does look that good. I managed to get a personal word with Younis Khan when he was exiting the premises and congratulated him on his magnificent 313 and wished him good luck for the series against Australia. He extended his hand, smiled, and simply said, "Thank you very much". so its high time for YK to dent the Ausssie confidence...But then is he ready and does he have the team ? Younis is ready Sam and he definitely has the team. Q, weather report pls - how hot is it now? Mornings - Sunny but windy..
Hey, pretty damn awesome stuff. You say Akhtar is fit? Ha! We will see, we will see. Hey man hav u got any details about the practice match between pakistan A and pakXI today? Anon, I do have some details, which I will put up in my next post..